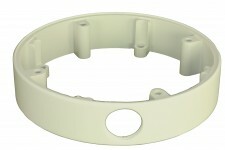 A surface mount ring for the interior and exterior vandal, fixed dome series. Cast aluminum, surface mount ring for vandal domes (CV & LV Series). The mounting ring provides a method of attaching a 3/4” conduit connector to the dome assembly and also provides space to store the dome’s pigtail and coupling connectors.